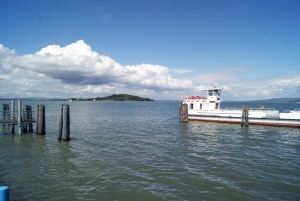 The island known as “Polvese” is situated in the south eastern part of the Lake Trasimeno and is the largest of the three islands of the lake. The island was used by the Citterio counts as a hunting lodge and a holiday home. In 1959 Pietro Porcinai, one of the greatest Italian landscape architects of that time, was commissioned by Count Giannino Citterio, owner of the island to (re)design the garden, the tennis court, the landing stage, and the swimming pool carved out of a former sandstone quarry. Porcinai created the landing stage consisting of a wooden jetty in the shape of a horseshoe within which the boat can be moored. Two rows of willows descend to the water’s edge bordering the wooden quay. The former flowerbeds were removed and the garden was divided into sectors, one of them being the herb garden. An abandoned sandstone quarry, a desolate and unattractive spot, was transformed into a garden of aquatic plants with a nature like basin, also used for swimming, with a maximum depth of 5.30 meters. The island known as “Polvese” is situated in the south eastern part of the Lake Trasimeno and is the largest of the three islands of the lake. The area is of particular historical and naturalistic interest. In the northern part oak woodland covers the island with many plant varieties which are typical for the Mediterranean area, as holm and ash tree. In the lower wood we find guilder rose, laurel, ilex and privet. The southern area is covered by a huge olive grove with centuries old olive trees. The humid area is characterized by an extended reed thicket that grows along from the east to the south. Ornamental plants and trees are present all along the meadows while rosemary hedges and pomegranate characterize the paths and the inner part of the island. An abandoned sandstone quarry, a desolate and unattractive spot, was transformed into a garden of aquatic plants with a nature like basin, also used for swimming, with a maximum depth of 5.30 meters. Around this basin Porcinai positioned a series of different „nymphs”, shallow bowls placed at different heights and in communication with each other, housing selected native and non-native aquatic plants (day and night blooming tropical water lilies, hardy water lilies, papyri, sacred lotus) and pickerel weeds (Pontederia). The water from the main basin trickles over the rim to feed the ponds, creating a continuous flow from the upper pool to the ponds with the water plants and down to the Trasimeno Lake. 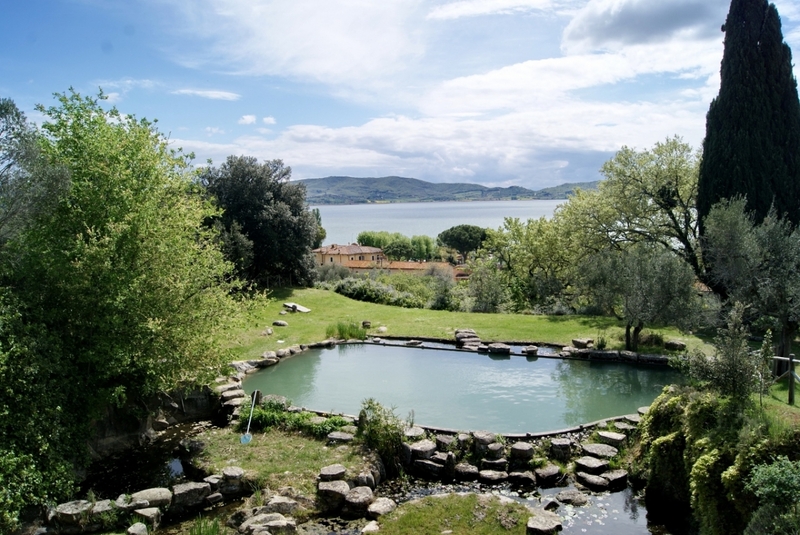 Particular attention was dedicated by Porcinai to generate for those who had plunged into the pool the feeling of continuity with the Trasimeno Lake. A meadow with olive trees surrounds the pool and nymphs. On the green Porcinai employed large slabs of stone from the former quarry as “drying racks”, which were used for sunbathing. There is also a good selection of typical plants of the Mediterranean climate such as myrtle, strawberry tree, thyme and lavender. The changing rooms and rooms for the treatment of water are located in the embankment under the lawn; they can be accessed by following a path made of sandstone. The Province of Perugia in 1988 and 1995 worked on architectural and functional recovery of this fine example of upgrading landscapes and ensures proper maintenance nowadays. Today the island also belongs to the Province of Perugia. Among the most important monuments of the island we find the church of Saint Giuliano and Saint Secondo, the former monastery of the Olivetans and the medieval castle. Isola Polvese is actually known as a scientific-didactic park with all facilities needed and is thus an important element within the Trasimeno Regional Park. Entrance fees: 3.00 Euro per person. The tour includes the Castle, the Church of San Giuliano, the garden of Porcinai and lasts 45 minutes. Tickets are available at the information desk on the Island. Opening times: Isola Polvese is accessible all year. 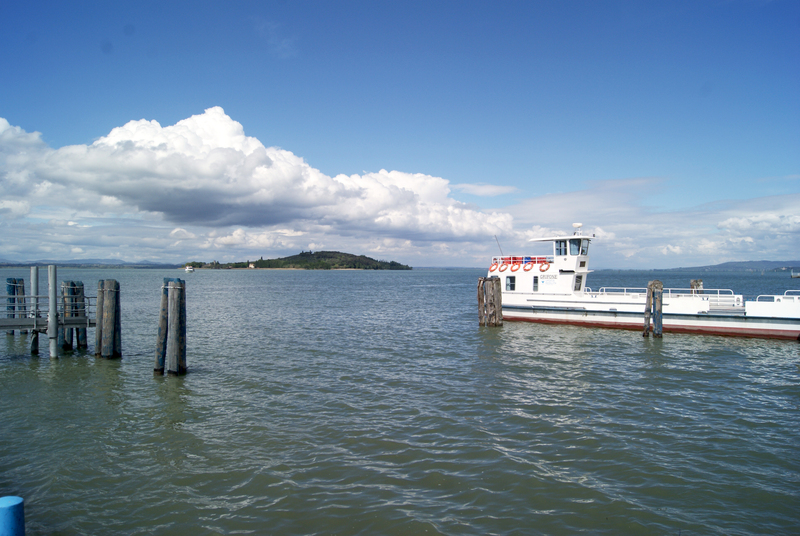 Please consult the ferry timetable:www.trasimeno.ws/. The information centre is open daily from 1st July until 31st August, and on Sundays and public holidays in June and September. Guided tours: Guided tours start each hour (different themes). Contact the information centre. No need to book in advance.